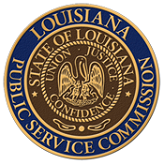 The Louisiana Public Service Commission (LPSC) is an independent regulatory agency dedicated to serving the public interest by assuring safe, reliable, and reasonably priced services provided by public utilities and motor carriers. The LPSC consists of five elected Commissioners who serve overlapping terms of six years and a staff of 92. Created by Article VI, Section 3-9 of the Louisiana Constitution of 1921, the LPSC succeeded The Railroad Commission of Louisiana, which was created by the Constitution of 1898. The LPSC's constitutional authority was reaffirmed by the Constitution of 1974, in Article IV, Section 21. The overall goals of the Commission are to ensure a regulatory balance that enables utilities to provide customers with safe, adequate and reliable service, at rates that are just and reasonable, equitable and economically efficient, and that allow utilities an opportunity to earn a fair rate of return on their investment. In addition, the Commission continues to take an active and cautious role in the development of a competitive, market-based approach to utility regulation whenever such an approach is in the public interest.